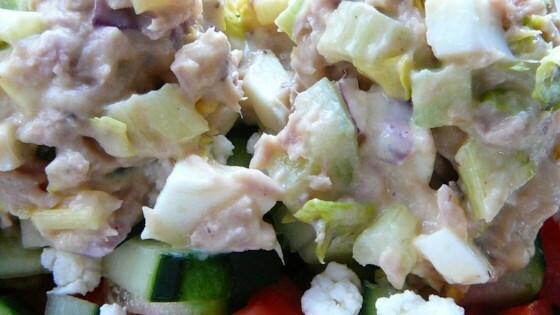 "My husband says this tuna salad is even better than his mother's. Not too pickly tasting, mild with a nice blend of flavor. You can add more mayo for a creamier salad." Combine tuna, eggs, onion, and celery in a large bowl. In a small bowl, stir together mayonnaise, relish, honey mustard, celery seed, seasoned salt, and pepper. Pour over the ingredients in the other bowl, and stir gently to coat. Serve at room temperature or chill until ready to serve. We ate this tuna salad at the Trout Lodge in Missouri. When we asked for the recipe, they gave us a print out from this site! We can't wait to make it at home! We enjoy sitting on our deck overlooking Lake Lanier and eating this wonderful Tuna Salad!Delicious!!! ENJOY!!!!! Thanks for sharing a great recipe! I did add some garlic powder for personal taste and hubby prefers sweet pickles instead of dill but it still tasted yummy!!! I've added this to my recipe box!